The Aljezur Surf School and Aljezur Villas Hostel, is the most experienced surf and accommodation offer you can find at Arrifana Beach, Aljezur, in the midle of the Natural Park Costa Vicentina branded now as Rota Vicentina, all in West Algarve and West Alentejo. 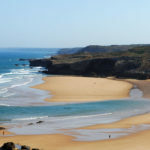 The project Rota Vicentina borned from a group of friends that wanting to promote the most virgin corner in Europe, and the most consistent and unspoilted surf spots for all levels of surfers taht you can find in the old continent. Aljezur Surf School offer the quality surf services like rentals, surf safaris and surf courses that is complemented with the great cozy accommodation for the visitors, so you can check our surf promotions to learn how to surf with us at Rota Vicentina. Aljezur Hostel, branded Aljezur Villas Hostel is for sure the best choice for who want to relax near the Arrifana Beach, please don´t equivocate, this is not a Hostel in the town named Amazigh Aljezur Hostel, we are close the beach in the middle of the Nature with heated pool, buffet breakfast all morning included, jakuzzi, fitness circuit, and so many good activities and oportunitys to explore the paradise. All this project started at 2004 when a young guy and surfer finished the university in Lisbon, and follow the feeling to move the life for Aljezur, Aljezur was an old town with few young local people, was possible to surf Arrifana beach alone all year around, in 2005 oppened the first big surf shop in Aljezur (Aljezur Surf Center) but with the turism trend in the area, fast understood that more surfers should be arrive soon, and they will need some good quality surf and accommodation offer. In 2006 the Aljezur Surf School gave the first classe and in 2009 was this great Hostel with the concept, for surfers but not only for surfers, for all guests, visitors, surfers and friends that know hot to valuate the details received the first guests of thousand in the last 5 years.